Thames Water is to invest in fixing leaks and infrastructure as part of a £11.7bn five-year plan. While some water companies are cutting bills, Thames Water's will remain unchanged, but it is proposing vulnerable customers will receive discounts. Since 2017, Thames Water has been fined more than £128m for poor management of leaks. 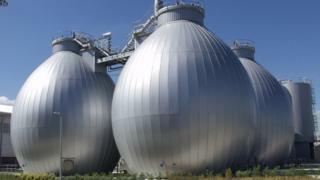 Bracknell Sewage Works and Fobney Water Treatment will receive a total of £46m. An investigation by regulator Ofwat found Thames Water "did not pay enough attention" to solving issues and the company had "failed its customers". Speaking to the BBC, Thames Water chief executive Steve Robertson said: "We cannot re-write the past, but we can look to the future. "This includes planning for a strategic reservoir for the south east region of England and exploring the potential of water transfers. "Our proposals are ambitious, well-costed and widely-supported by our customers, who agree we should prioritise the most vulnerable." Other water companies have revealed plans to reduce their charges, which include Severn Trent cutting the average bill by 5% and United Utilities by 10.5%. Thames Water said it was "very hopeful" its plan would be accepted. Ofwat will publish an assessment of each company's plan in January 2019.